When you choose to work with us at Benjamin Franklin Plumbing Inc. – Leland, you can expect high-quality and professional plumbing services in the Wilmington, North Carolina area. Whether you have a clogged drain or need assistance with water heater repair, our plumbing contractors are your top choice for the job! At Benjamin Franklin Plumbing Inc. – Leland, we are excited to provide you with the plumbing services you need and have come to expect. At any given time, you can call us, and one of our plumbers will be to your or home business in no time. When you choose us at Benjamin Franklin Plumbing Inc. – Leland, you can expect prompt, reliable and affordable service that gives you confidence your plumbing concerns are a thing of the past. In fact, your satisfaction is 100% guaranteed, and our trucks are fully loaded so we can handle any issues that come our way quickly and efficiently. When you need plumbing repair, the last thing you want to do is call around town trying to find a plumber with the tools and experience to do the job. At Benjamin Franklin Plumbing Inc. – Leland, our professional team is known for its on-time service, straightforward pricing, and a 100% satisfaction guarantee. The need for water heater repair could be caused by a number of things, including burned-out elements, rusty pipes, or your water heater reaching the end of its lifetime. At Benjamin Franklin Plumbing Inc. – Leland, we can assess the situation, take steps to complete water heater repair, and then we’ll make sure you are 100% satisfied that the job is complete. At Benjamin Franklin Plumbing Inc. – Leland, we are proud to be a top provider of plumbing services and plumbing repair in Wilmington, North Carolina. At Benjamin Franklin Plumbing Inc. – Leland, we provide all the plumbing services you need for your home or commercial business in Wilmington, North Carolina. We offer a variety of plumbing repair services for homes in the Cape Fear area. From clogged drains to leaky faucets and water heater repairs, we provide all the plumbing services you need. We work 24/7, so no matter what, you always have a professional plumber ready to help. Our plumbers are trained and certified, and most importantly, they are hand-selected for the job. 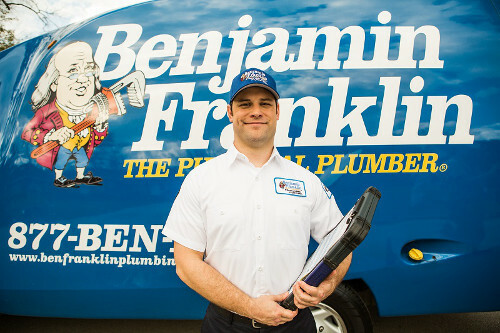 Only the best plumbing contractors can wear the Benjamin Franklin Plumbing uniform! Learn More About Us ! We respect your time and provide straightforward pricing, so no matter what your plumbing problem is, we’ve got you covered. If you need plumbing services in Wilmington, give us a call today for all your plumbing and water heater repair needs!